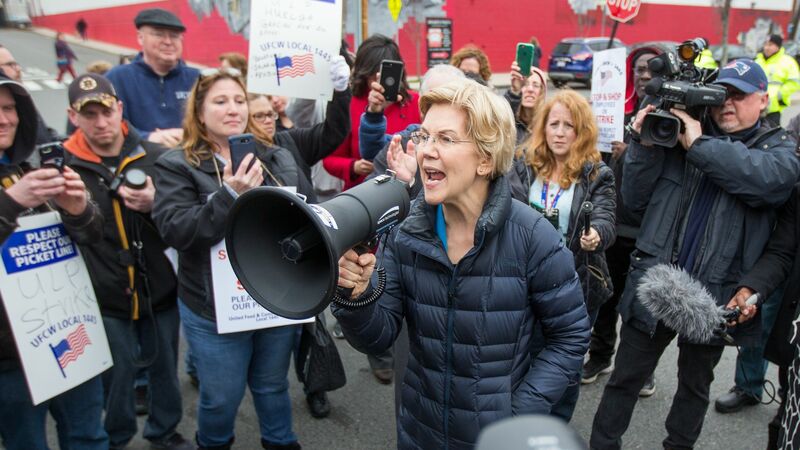 2020 hopeful Sen. Elizabeth Warren (D-Mass.) proposed a broad plan on Monday to protect America's public lands, another addition to her list of proposed policies to set herself apart from a crowded Democratic field. The big picture: Warren's proposal would reverse some of the Trump administration's most visible energy policies, including an executive order on her first day in office that would end drilling offshore and on public lands. It would also require that 10% of U.S. electricity generation must come from renewable sources located offshore or on public lands. "We must not allow corporations to pillage our public lands and leave taxpayers to clean up the mess. All of us — local communities and tribes, hunters and anglers, ranchers and weekend backpackers — must work together to manage and protect our shared heritage." Free entrance to national parks. Unlocking 50% of currently inaccessible federally owned land for public use. "A 21st century Civilian Conservation Corps" with 10,000 young people, funded by an increased AmeriCorps budget. Using the Antiquities Act, an early 20th century law, to restore protections for national monuments that had been opened up to development by the Trump administration. Incorporating state, local and tribal stakeholders for public land management. Why it matters: Why it matters: U.S. District Court Judge Sharon Gleason's ruling against Trump's 2017 order reinstates a ban on offshore drilling a in wide region off Alaska's coast and part of the Atlantic Ocean. What she's saying: Gleason ruled Trump's order "exceeded the President's authority." "The wording of President Obama's 2015 and 2016 withdrawals indicates that he intended them to extend indefinitely, and therefore be revocable only by an act of Congress," said Gleason, who was nominated to the bench by Obama. Our thought bubble, from Axios' Ben Geman: Legal hurdles are just one of many uncertainties clouding the potential for Arctic offshore drilling, despite what are thought to be huge hydrocarbon deposits in the region. Projects in the harsh seas are expensive, and companies have a wealth of other opportunities to pursue in the lower 48 states and elsewhere.